Summary: Sherlock and John reap the benefits of Sherlock's sagacious choice. Spoilers/Warnings: Mild for S1.03--"The Great Game"
Written for the fan_flashworks challenge "stripes". This is part three of a series. Previous parts can be found here: Indecision, Revelation. 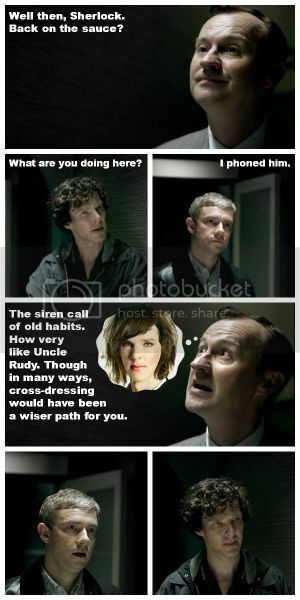 Summary: Sherlock weighs the options in his own inimitable way, and makes his choice. Written for the fan_flashworks challenge "burn". Summary: Sherlock had always prided himself on his powers of deductive reasoning. He could visualize, work through, and discard more options in seconds than most people could in days or even weeks. So why was this decision so difficult? Spoilers/Warnings: Mild for S1.02--"The Blind Banker"
A/N: Written for the fan_flashworks challenge "choices". Summary: A light flared. Sherlock craned his neck upward. Looming above him was a freakishly tall, winged figure with dangling ears and a single glowing red eye. Sherlock's body froze in limb-locking, breath-holding terror before his rational mind had a chance to catch up (stupid transport!). He couldn't be seeing what it looked like he was seeing. He couldn't be. Because it looked like a monstrous cyclops had strode straight out of the pages of mythology to terrorise Baker Street. A/N: Inspired by the fan_flashworks pompt "footwear" (though it also works for the seasonal prompt "haunted"), my hc_bingo square "blood loss," and the land_deduction prompt "Sherlock". Summary: Sherlock doesn't do boredom well. And he knows it. A/N: Inspired by the land_deduction prompt: "My life is spent in one long effort to escape from the commonplaces of existence." (Sherlock Holmes, The Red-Headed League), the "drugs" prompt at fan_flashworks, and my hc_bingo square "substance addiction." Summary: Seeing too much is the curse of (every) Sherlock Holmes. A/N: Inspired by the land_deduction prompt: "What do you see?" / "Everything. That's my curse." (Sherlock Holmes: A Game of Shadows), the "family" prompt at fan_flashworks, and my hc_bingo square "difficult/unexpected pregnancy." Summary: The real tragedy might be that Sherlock believes the mask is real. A/N: Created for the fan_flashworks challenge "masks", the land_deduction quote prompt, "You can imagine the Christmas dinners." (Mycroft Holmes, Sherlock); and my hc_bingo square "forced to participate in illegal/hurtful activity". Summary: A scene from the unreleased Sherlock Halloween Special (that only exists in my head, alas). A/N: Created for the fan_flashworks challenge "haunted" and for the land_deduction prompt "Halloween". Summary: John rarely sees what Sherlock sees. Sometimes, John is chagrined by this. Sometimes, it's a good thing. Spoilers: Mild for S2.02, "The Hounds of Baskerville"
A/N: Inspired by Mycroft's quietly-delivered (and all the more sinister for it) bombshell at the end of "His Last Vow" regarding the fate of a certain family member. I hope this gets explored more in Season 4! Created for the fan_flashworks challenge "family". Sherlock (BBC): Fanfic: Hot Enough For You? Title: Hot Enough For You? Summary: As it turned out, violin-playing and not talking for days on end weren't the only things Sherlock should have warned John about. Inspired by Benedict's Cumberbatch's preparations to play the role of "Sherlock" as detailed in "Fact #19" here: "Sherlock Facts: 21 Things You Didn't Know". Summary: Ianto and Owen are undercover as a married couple on a gay cruise. What could possibly go wrong? A/Ns: This is part six of the "My Big Gay Cruise" drabble series. Each part is a stand-alone drabble. Previous parts are here: "My Big Gay Cruise". Written for the fan_flashworks amnesty challenge "The Lost Hour" and the tw100 How I Met Your Mother reverse fandom challenge: "The Time Travelers". A/Ns: This is part five of the "My Big Gay Cruise" drabble series. Each part is a stand-alone drabble. Previous parts are here: "My Big Gay Cruise". Written for the fan_flashworks challenge "Health and Fitness" and the tw100 How I Met Your Mother reverse fandom challenge: "World's Best Couple". Summary: He'll do whatever it takes to save her. Whatever. It. Takes. Warnings: Angst. A whole lot of angst. A/Ns: The quotes from the show were taken from the “Cyberwoman” transcript by beccaelizabeth. The timing of canon events is based on the Torchwood timeline by lefaym. Inspired by “Sad Lisa” by Cat Stevens (though it's not a songfic). See end notes for more on this. Written for the fan_flashworks challenge "Monsters". A/N: For the fan_flashworks challenge "drugs" and the land_deduction challenge "Bingo, My Dear Watson" prompt "painting". Sherlock lifts a shoulder in a small shrug. “You're not. Believe me when I say you're not." A/N: For the fan_flashworks challenge: "Fight"
Summary: He thought she felt the same way. He thought wrong. A/N: For the fan_flashworks challenge: "Flight"